Predictions for 2020 promise 50B connected devices and 1.7 megabytes per person, per second. That’s a lot of data to process, and we’re not even including cows and cats. How will all that data become actionable, operational intelligence? Beyond Limits, a spin-off from CalTech and NASA Jet Propulsion Labs, believes it has the answer. 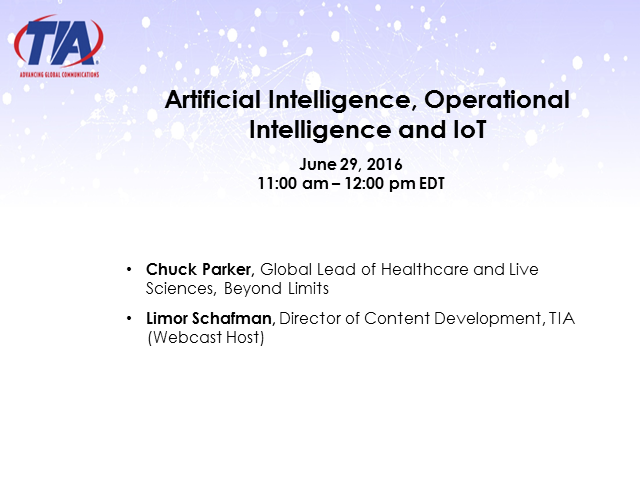 Chuck Parker, Global Lead of Healthcare and Life Sciences at Beyond Limits, will discuss how the company is migrating artificial and autonomous intelligence technology used by NASA to run the Deep Space Network (including all rovers) to address the zettabytes of data IoT will employ. The technology is built upon high-speed machine learning engines and includes powerful cognition, prognostication and self-learning intelligence. It’s Automated Intelligent Knowledge bases allow for intelligent interaction with humans to drive automated processes, such as how to sign up for insurance or follow up with patients who need healthcare home monitoring. We will take a look at use cases in the healthcare and energy industries, where the technology is currently deployed. Please join us for what will be a fascinating conversation. And bring your questions! This program is not BICSI accredited. TIA is the Telecommunications Industry Association. Our members are the network operators, service providers, OEMs and suppliers that build the communications and information networks of today and tomorrow. We are a standards, policy, and market intelligence organization. We produce numerous events, and I invite you to visit us to learn more: www.TIAonline.org.